It’s 1968. Or maybe it’s 2008. America is in turmoil. The White House routinely lies to Americans, the CIA and FBI are secretly but consciously ignoring the laws that govern them, and many people worry about the state of our democracy. The country is divided over an unpopular war half a world away, which we’re continuously told we’re winning. They repeatedly tell us they have the enemy “on the run” and that there is a “light at the end of the tunnel.” There are anti-war protests and demonstrations across the nation and on college campuses. On the warfront, the Department of Defense keeps changing the rules on our military personnel, extending tours and requiring additional tours. They started the conflict with too few forces but have been adding troops without a real end in sight. What does winning mean? When can we leave? Is it even possible to leave behind a functioning democracy? And the Russians invade one of their neighboring countries. Our national cynicism grows and political satire finds new popularity on television. Many pop music artists and filmmakers also turn their artistic attentions to politics and social issues. The President is extremely unpopular but is not up for reelection. The Democratic presidential primary essentially boils down to the anti-war candidate versus the hawk. The Republicans nominate a candidate that the party’s base does not trust. But most surprising of all, with all this unrest and cynicism comes a renewed faith in the average person’s ability to change our country through the political process. Young people, now a significant voting block, are wildly energized about the election and they line up enthusiastically behind an unlikely presidential candidate, a young, handsome, charismatic Democrat trumpeting a new kind of politics, who is rumored to have taken illegal drugs in his youth. But because of what he represents, some fear for the candidate’s life. American Catholics are at odds with the Pope over birth control and other social issues. Organized religion in general is experiencing a decline in popularity, as many American turn to alternative philosophies and spiritualities, especially those from Eastern cultures. And there is a growing movement to legalize marijuana. I love you guys but I have to tell you why you have a special place in my heart and it all has to do with an ugly nutcracker. I drag out this hippie nutcracker every Christmas and put him on my mantel. 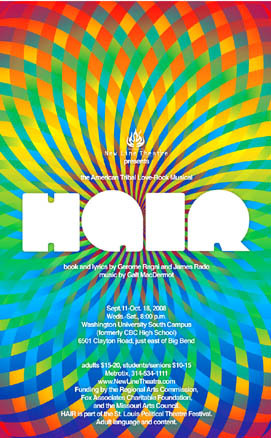 It all has to do with your production of Hair in 2008 and my Grandmother (Gummy's) last great adventure. 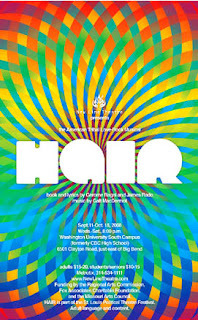 She had always wanted to see Hair and loved the soundtrack. So, a bunch of us got together and parked her in the front row. You guys were fabulous and she had the time of her life. Several months later around the holidays, I saw this Hippie nutcracker paying tribute to Hair. Having inherited her sense of humor I promptly bought it. She adored it and it sat on her mantel until the day she died. She talked about New Line all the time. When she passed, my relatives said Dude the nutcracker was hideous and politely asked me to take him home. He lives with me now and has a place of honor on the mantel and always will. He protects us from that creepy narc Elf on the Shelf since Dude doesn't move or watch our every move. He minds his own business. He told me he likes his new tree farm I made for him. Thank you for the memories and I hope to see another production soon.